In all fairness, let me back this discussion up a little bit. If you are unfamiliar with both, this is basically a tomato stew. Shakshuka is Middle Eastern in origins. But the addition of eggs might make this North African in origin as well. Eggs in purgatory might be the looser name for the same basic premise: a tomato stew with eggs cooked into it. Premise aside, the key difference here is the spice blend. This particular shakshuka is mildly spicy. And while the ingredients don’t list it, there is a good helping of cumin here. Or at least that was the flavor note that came through all the flavors here. Basically for $1.99, you are getting the pre-made tomato stew. If the name isn’t clear enough, this is a starter, not a finisher. Everything else you’ll need to add in. Eggs are the obvious answer, but you’ll probably want some bread, naan, or Malabari paratha to dip into this to enjoy this more. This is way more tomato than it is bell pepper. So just be aware this is going to eat a lot like a thick pasta sauce. Are you limited to just adding in eggs? I don’t see why you would be limited to just that. Goat cheese, tofu, chicken or pretty much any other protein you have in the refrigerator would make for a satisfying mix in here. Just be sure to season that as well. If you notice the picture on the box, there is a really salted and peppered egg. That extra layer of flavor is totally worth it. I made this on the stove top and the directions worked perfectly. Except for the egg part. I was really wishing for a breakdown of how long to cook the eggs to get certain desired egg textures. Mine did take a touch longer than the 2 minutes. I like my egg yolks runny; the egg whites not so much. Overall, if you are looking for a healthy meal this is a good one. And while I’m pretty sure this isn’t something you’d try to make at work, it did make for a nice light lunch or brunch meal. But, be sure to bring something to dip into this. I enjoyed using some bread as a utensil to eat this with than I did any fork or knife. Would I buy this again? 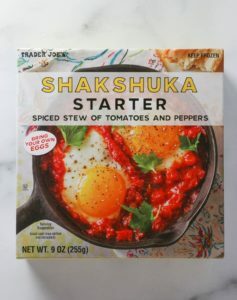 I’d consider buying Trader Joe’s Shakshuka again. 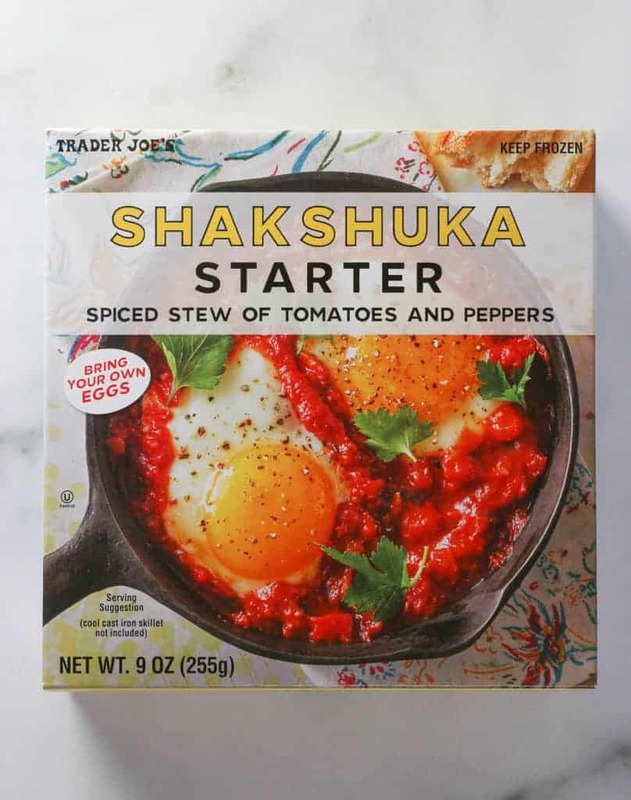 Product Description: Trader Joe's Shakshuka Starter is pre-made spiced tomato and pepper stew. 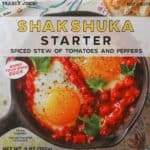 Trader Joe’s Shakshuka Starter is a pre-made tomato stew. An easy, fresh, and delicious meal that can serve one or two. Cumin is one of those love it or leave it spices, so be aware this is the most pronounced spice. 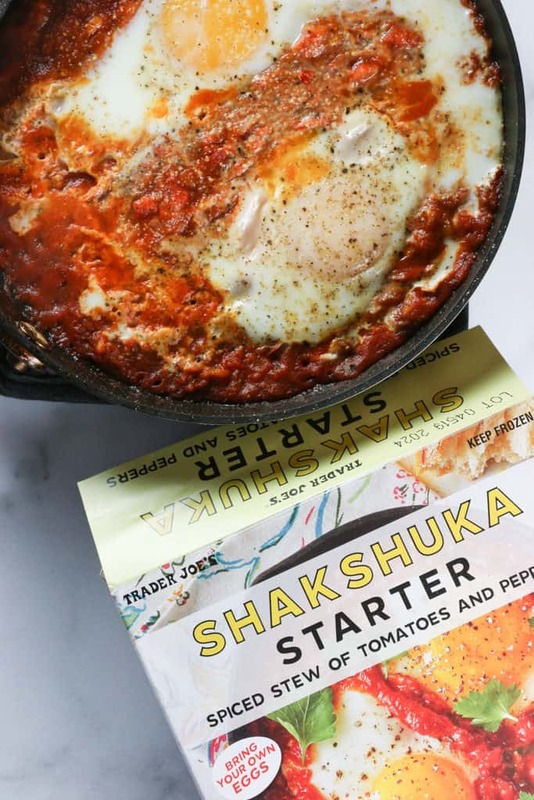 Why limit to shakshuka? Use it for pasta sauce, pizzas, and anything else that calls for tomato sauce. Also it’s vegan so it is awesome! Many different approaches can be done here. Hey Alek! Thanks for the suggestions and for always stopping by! I found the directions to be wayyyyy off. I would maybe cook this for about half as long. The sauce became burnt and acrid and the eggs were solid. Hey Lysa! Just out of curiosity- which way did you make it? Microwave or stove top? This looks so good! After having made Shakshuka with Blue Apron we are fans. Hubby has some sourdough starter so we may have to try this soon with some sourdough bread! Hey! This is a great one with bread. This has quite a bit of cumin taste so be ready for that flavor. But this is pretty good for something out of a freezer box. Thanks so much for stopping by! After you add the eggs once the whites are starting to set spoon some of the hot sauce over the whites only- not the yolks- and that will help them cook while keeping a runny yolk. That said, I don’t eat eggs any more but i did buy this and make it with medium tofu- i think firm would be too firm here. I definitely added a good pinch of salt and just let it all simmer a while on a low heat. I didn’t have any bread around but i did have some of the harvest grains mix so i put that in the bottom of my bowl which worked well. After you add the eggs and the whites start to set a little spoon some of the hot sauce over the whites- not the yolks- and that will help the whites cook all the way while the yolk stays runny. The photo on the front of the box is misleading. I don’t eat eggs anymore myself, but i did make this with medium tofu (firm would be too firm here i think) that i just cut into slices. I didn’t have bread around but i did have leftover cooked ancient grains harvest mix so that was in bowl and worked well. Really tasty and super fast! I’ll definitely pick up a few for the freezer next time I’m there, chickpeas or lentils would be great here too. Very tasty! I’ve always wanted to make shakshuka, but couldn’t convince my family. This starter was incredibly easy to make and made a nice light meal for me, however I sprinkled Parmesan cheese over the top. I plan to buy more the next time I’m at Trader Joe’s. Hey Linda! I’m glad you liked this too. Thanks so much for taking the time out of your day to stop by and share! I really want to make this in my cast iron pan and bake it a little, do you have any suggestions? Thanks! Hey Kate! How big is your pan? This only filled my smallest non stick pan.